The reduction of maternal mortality remains one of the most important social and developmental challenges currently facing the African continent. Available evidence suggests that of the eight Millennium Development Goals, the fourth goal, aimed at reducing maternal mortality rate by 75% by 2015, is the one most unlikely to be attained in many African countries1. The technologies to prevent and avert maternal deaths are known, but the will to apply them on a large scale is still lacking in Africa. The World Health Organization has identified four main interventions as critical in efforts to reduce maternal mortality in developing countries2 . These are family planning, antenatal care, skilled birth attendance and emergency obstetrics care. It is now recognized that countries with high rates of maternal mortality have low uptake of these four essential interventions. By contrast, countries that have successfully reduced maternal mortality consistently have much higher uptake of these interventions. As an example, Sweden with one of the lowest maternal mortality rates in the world has a contraceptive prevalence rate of 78%, antenatal attendance by pregnant women of 98%, skilled birth attendance of nearly 100%, and almost universal access to emergency obstetrics care3. In comparison, Nigeria with the second highest maternal mortality rate in the world has a contraceptive prevalence of only 8%, antenatal attendance of 60%, skilled birth attendance of 30%, and very poor access by pregnant women to emergency obstetrics care4. While increased access to evidencebased interventions is a key strategy for promoting safe motherhood, the quality of services received is also important and critical. It is not enough for women to receive antenatal, delivery and emergency obstetrics care, the quality of care they receive at these points is also an essential determinant of their survival. Thus, safe motherhood initiatives must focus on access and quality of care as component dyads in efforts to reduce maternal mortality in Africa in the coming years. Several socio-economic factors have been recognized as being associated with low access and poor quality of maternity services in African countries. These include poverty, illiteracy, ignorance, harmful traditional practices, religious beliefs, socio-economic disempowerment of women, and the poor health infrastructures in these countries. Consequently, any efforts aimed at increasing women’s access and the quality of maternity services, must address one or more of these social impediments if such programs are to achieve their intended objectives. 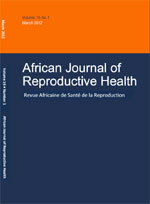 This edition of the African Journal of Reproductive Health (AJRH) features eight original articles that report empirical data associated with maternal mortality in Africa. The first four articles5, 6, 7, 8 report high rates of maternal mortality in Nigeria and Malawi, and some of the medical and social factors associated with the high mortality rates in the two countries. In particular, the paper from Malawi7 used a case-control study design to identify the clinical, demographic and service-related factors that are associated with postpartum maternal mortality. The results showed that poor recognition of high-risk mothers and inadequate emergency obstetrics care offered to women were the most significant predictors of postpartum maternal mortality in Malawi. The next four papers in this edition of the journal report various scenarios of quality of maternity care and access in Nigeria, Tanzania and Senegal. The paper by Oladapo et al9 documents poor quality of antenatal care within primary health care settings in Southwest Nigeria. Also, using criteria-based clinical audit, Fawole and colleagues10, reported poor quality of obstetrics services in the same region of Nigeria. Similarly, Nyantems and colleagues11, using the WHO safe motherhood needs assessment instruments reported severe shortages of essential categories of health staff for perinatal care in Tanzania, which reflect extremely huge perinatal care workload, with severe compromise of the quality of care provided. It is against the background provided by these seven papers that the eighth paper that evaluates a policy of free delivery and caesarean policy in Senegal12 needs to be understood. A policy of free maternal services obviously eliminates poverty as an important barrier to utilization of services, and would likely increase access to evidence-based maternity services to pregnant women. Experiences from countries like Ghana, Burundi, South Africa and Niger that have implemented free maternity services13, 14, 15, 16 have reported significant increases in the numbers of pregnant women using formal antenatal and delivery services. However, subsequent evaluations of such programs have frequently reported substantial clients’ disaffection as a result of poor quality of services provided, in large part, due to lack of planning and the poor financing of such programs. It is not surprising therefore that the results of key informant interviews of the free delivery and caesarean policy in Senegal reported in this edition, showed general disaffection with the implementation of the policy in Senegal. However, it is the view of this journal that the result of the evaluation of this policy should not discourage African governments from implementing free health policies for pregnant women. By contrast, such policies have been recommended by the WHO17 as capable of increasing government’s commitments to maternity care and increasing access to evidence-based services for pregnant women. What is required is to ensure that when such policies are enunciated, adequate efforts should also be put in place to improve the quality of care provided, and sufficient financial, human and infrastructural resources need to be devoted to accommodate the expected increases in service utilization. No one expects that maternity services would be free permanently for women in the African region. However, as we are only seven years away from 2015, and with evidence accumulating that many African countries are still far behind in achieving the maternal health related Millennium Development Goal, a short term remedy such as free maternity services is desirable to rapidly remedy the situation. The long term solution is for African governments to concentrate efforts in improving their national economies, creating wealth for their citizens, reducing the levels of poverty, and investing in health, education and social infrastructures, as critical measures to reduce maternal mortality on a sustainable level. In conclusion, increasing access to family planning, antenatal care, skilled birth attendance and emergency obstetrics care is an important strategy to reduce maternal mortality in Africa. However, efforts aimed at increasing access should be complemented with improvement of the quality of care provided, without which very little results can be achieved. We call on policymakers to devote substantial resources to achieve universal access to quality services for the four key interventions in efforts to significantly reduce maternal mortality in the African continent before 2015. Gribble J, Haffey J. Reproductive health in sub-Saharan Africa. Population Reference Bureau, 2008: www.prb.org. World Health Organization. Road Map for Accelerating the Attainment of the MDGs Related to Maternal and Newborn Health in Africa. World Health Organization, 2005. Available: http://www.afro.who.int/whd2005/mdgroadmap -eng.pdf (Accessed 15 July 2005). National Population Commission [Nigeria]. World Summit for Children indicators, Nigerian 2003 Nigeria Demographic and Health Survey 2003. Calverton, Maryland: National Population Commission and ORC/Macro, 2003, page 333. Abe E, Omo-Aghoja LO. Maternal mortality at the Central Hospital, Benin City, Nigeria: A ten-year review. Afr J Reprod Health 2008; 12(3): 17-23. Kanyighe C, Channon A, Tadesse E, Madise N, Changole J, Bakuwa E, Malunga E, Stones RW. Determinants of post-partum maternal mortality at Queen Elizabeth Hospital, Blantyre, Malawi: A case-control study, 2001-2002. Afr J Reprod Health 2008;12(3):35-48. Wagbatsoma VA, Omoike BI. Prevalence and prevention of malaria in Edo State, Nigeria. Afr J Reprod Health 2008;12 (3):49-58. Oladapo OT, Iyaniwura CA, Sule-Odu AO. Quality of antenatal services at the primary care level in Southwest Nigeria. Afr J Reprod Health 2008;12(3):71-92. Witter S, Diadhiou M, Fawole AO, Hunyinbo KI, Sotiloye OS, Otolorin EO. Evaluation of criteria-based clinical audit in improving quality of obstetrics care in a developing country hospital. Afr J Reprod Health 2008;12 (3):59-70. Nyamtema AS, Urassa DP, Massawe S, Massawe A, Lindmark G, Van Roosmalen J. Staffing needs for quality perinatal care in Tanzania. Afr J Reprod Health 2008;12(3):113-124. Witter S, Diadhiou M. Key informant views of a free delivery and caesarean policy in Senegal. Afr J Reprod Health 12 (3):93-112. 13	Witter S, Arhinful DK, Kusi A, Zakariah-Akoto S. The experience of Ghana in implementing a user fee exemption policy to provide free delivery care. Reprod Health Matters 2007 Nov; 15(30): 61-71. Schneider H, Gilson L. The impact of free maternal health care in South Africa. In Safe Motherhood initiatives; Critical issues, edited by Marge Berer and TK Sundari Ravindran. Oxford, England, Blackwell Science, 1999. : 93-101. Diop F, Yazbeck A, Bitran R. The impact of alternative cost recovery schemes on access and equity in Niger. Health Policy Plan. 1995 Sep; 10(3): 223-40. James CD, Hanson K, McPake B, Balabanova D, Gwatkin D et al. To retain or remove user fees? Reflections on the current debate in low-and middle income countries. Appl Health Econ Health Policy. 2006; 5(3): 137-53.